-Sonic Union and Blackrose launched a campaign for adidas’ Y-3 (video above). -Havas is launching its third media network, Fullsix Media. 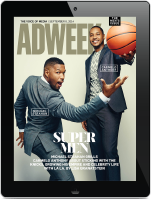 -Native ads now account for around half of Slate’s ad revenue. –2C Creative and Flipeleven Creative launched a digital joint venture called Flip2C. –What can advertising learn from art and architecture? McCann’s Adrian Botan reveals some. -Diageo appointed former Samsung and P&G marketer Vince Hudson as global brand director for Smirnoff. -Big Spaceship strategist Tina Yip says brands shouldn’t give up on Vine yet.